Did You Know Robotics Can Improve Employees Health? Here’s How! Robots have numerous potential benefits for the manufacturing space, including increased efficiency and reduced operating cost. They can also lead to improved safety and health for employees, both by sensing potential dangers in the workplace and taking over the riskiest tasks. Here are some workplace hazards that robots can tackle. 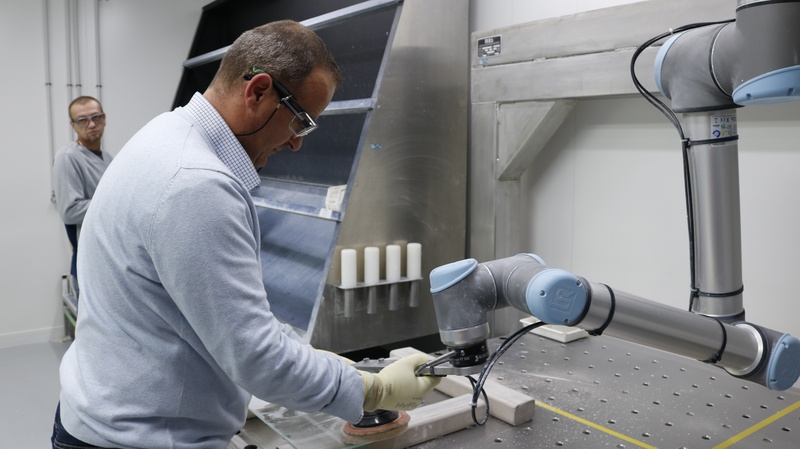 A Saint-Gobain facility reduced workers injuries and increased productivity with the Robotiq FT 300 Force Torque Sensor. Performing the same movement repeatedly, especially at high speeds, can cause repetitive strain injury. Factory workers often perform this kind of work. Symptoms of repetitive strain injury include pain, swelling, cramping, and weakness. These symptoms can become chronic if the task is performed for a long time or at high intensity. Robots are perfectly suited for completing repetitive tasks, and the equipment and programming required is simple. For example, after noticing the toll that repetitive tasks was taking on employees, a cheese-packing factory in Sweden added four robots to help with packaging. The robots do their job well, packing 90 units of cheese per minute, and have eliminated repetitive strain injuries on the line. Industrial work can also involve potentially hazardous substances. Robots can take over these tasks to prevent employees from coming into contact with health risks. Welding, for example, releases harmful fumes. Acute exposure can cause eye, nose, and throat irritation as well as dizziness and nausea. Prolonged exposure can damage the lungs, nervous system, and kidneys, and may lead to several forms of cancer, depending on the fumes. Weller has tackled this problem with their benchtop welding robot. It’s a fully enclosed system that extracts welding fumes and dramatically reduces workers’ exposure to harmful chemicals. Robots can also save workers from hazardous environments or heights. To inspect, maintain, and repair the pipes connecting offshore oil rigs to the ocean floor, for instance, workers need to rappel from the platform. At times, they must also dive underwater or climb tall equipment. All of these situations are risky. Some oil companies are now using robots to perform these tasks. BP’s Thunder Horse oil platform uses a robot with magnetic tracks that can move along pipelines and other equipment to inspect it. The energy industry is also turning to aerial and underwater drones for equipment inspection and maintenance. You don’t need to work in an exceptionally dangerous environment for robotics to improve worker safety. Incorporating automation into standard factory equipment can also help improve the health and safety of employees. Using cameras and smart technology with a forklift, for example, can prevent collisions. Driver-assist features in cars use a similar method. Companies can now even use driverless forklifts in their warehouses. Worries that robots are taking our jobs are common in today’s world. It’s true companies are automating tasks that human workers once did, but many of these duties involve the greatest risk. Robotics will cause companies to cut some positions, but new roles will also open up for workers to oversee robots, work on automation equipment, and take on other responsibilities. The workforce has always adapted to new technologies by shifting its focus. That’s not to say the change will be easy. Adjusting to this new work world will require workers to learn new skills and ways of operating. As we make the transition, however, let’s do it in a way that improves their health and safety of our employees.